PATH TO SUCCESS Reflecting on República's beginnings, Jorge Plasencia (left) and Luis Casamayor (right) say their path was never planned. “We just knew we wanted to do something special and didn’t look back,” Casamayor says. If República were a person, Luis Casamayor and Jorge Plasencia would be the right and left brains of the operation. 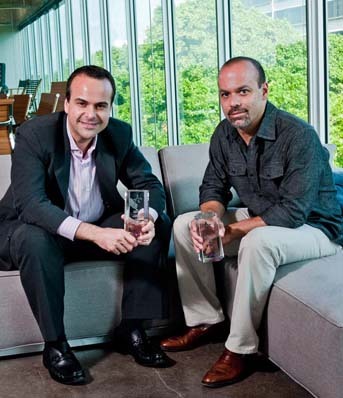 While Casamayor provides insights that push the creative envelope and Plasencia delivers savvy-driven marketing approaches, they meet in the middle at the heart of their business, the values upon which it was built and operates to this day: honesty, trust, and concern for individuals—all things that reign at República. Plasencia and Casamayor were introduced at the former’s birthday party in 1999. Casamayor, at the time head of Cosmyk, a creative shop specializing in strategic graphic design, and Plasencia, vice president of Estefan Enterprises, were both experiencing success in their respective industries, but as they learned of each other’s passions and endeavors, they realized they both sought something more. They could see the landscape of American marketing changing as the Hispanic population grew, as did the demographic’s attractiveness to brands. More than just the opportunity to communicate with their community, the men wanted to seize the chance to tailor messages that celebrated, appealed to, and honored the cultures that define Hispanic Americans. We strive to be authentic in everything we do. Losing money is easy to turn around, losing our reputation isn’t. We guard it above all else. We believe in talent. Talent is our key to success. We want our talent to excel and develop to their fullest potential. So we help República employees and partners forge a path to the success that they desire. Our talent is compensated for the value they generate, not just the hours they work. We want our clients to compensate us this way too. We believe in a team approach to our work. Dedicated client teams are at the core of our business. We value people who accept responsibility and mean it when they say: “The Buck Stops Here.” We feel that our clients need to live by this philosophy as well. We’re transparent and have nothing to hide. We act ethically and are loyal to each other and to our clients. We understand that we’re not right for every client. We will resist the temptation to work for everyone and will only choose clients that inspire us. República focuses on creating value for clients with every move we make, every job we take. We believe in great work, great people and great clients, which will naturally result in great growth. But we don’t pursue growth by itself because it usually won’t result in great work, great people, and great clients. We will be compensated fairly for the value we provide and say no to unreasonable expectations. We’d rather turn down work than take on something that we can’t deliver at the highest level. Speaking of great work, we like the fun, exciting, and fulfilling kind. Above all, somos familia. We believe in family, our own families, and our República family. Everyone contributes to the vision, goals, and purpose of República because this is the purpose of it all: to create something great and share it with the people we love. It’s no surprise such ideas came from the minds of the men who consider República to be more than a business, but a passion. And it was with a passion both for advertising and the prosperity of the Latin American community that the men took on Univision Network and the Gates Foundation’s Es El Momento campaign in 2010. Now in its third phase, the campaign is a multiplatform effort to increase awareness, inspire interest, and encourage attainment of education among Hispanics, whose graduation and college attendance rates fall short when compared to those of their non-Hispanic peers. “That this campaign, which we created, has been so impactful in starting to shift the Hispanic student paradigm is just so exciting and makes me feel so good,” Plasencia says. Last year, the partners decided they wanted all of República’s employees to partake in that feeling that doing good brings, so they created Repúblicares, a pro bono program benefitting nonprofits that apply for marketing and communications services and are chosen by República employees. “It’s a total family environment,” Plasencia says of the collaborative, non-hierarchical company he and Casamayor have built. “Somos familia,” is another of the principles they live and work by. Like a family, the office celebrates each employee’s birthday with a cake. The staff barista knows just how each team member likes his or her own cafecito or café con leche. Little touches like these, and others like a game room with billiards, foosball and Ms. Pac-Man, as well as a full gym and showers, have turned the company’s Miami office into more than just a place to house their operation, but rather, a home for their passion. It’s a place where everyone lives the Hispanic cultures, Plasencia says, from the foods they eat to the music they listen to. The ubiquity of the Latin influence made the company an obvious choice for Goya, who reached out to República in 2011 for help in reaching the foodie community through a “Latinization” of American culinary staples campaign. From brisket to meatloaf—they even created a black-bean cupcake with celebrated pastry chef, Hedy Goldsmith—the campaign has been a hit. Growing from $1 to $12 million in revenue in six years takes more than luck, but Casamayor says they only knew hard work and determination would help lead them to the end they were working toward. The men credit their success to their ethics, which have been the foundation of good business and, in some cases, personal relationships. “That comes with maturity and experience,” Casamayor says. “There’s also an element of being fearless, and that’s something that comes with time.